Sean Quinn, his son, and his nephew could face prison sentences today if the High Court finds they have not complied with its orders. 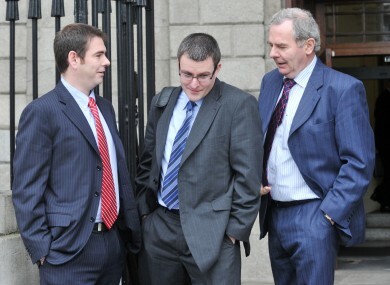 LAST MONTH SEÁN Quinn, his son Seán Junior and nephew Peter Quinn were found guilty of contempt of court. They were described by Justice Elizabeth Dunne as “evasive” and said that Peter Quinn “conveyed the impression of someone reluctant to be in court, to say as little as possible and of someone who simply did not tell the truth”. Today she will assess the cooperation of the members of the Quinn family in reversing the steps they had taken to put assets out of the reach of the Irish Bank Resolution Corporation, formerly Anglo Irish Bank. The IBRC said that members of the Quinn family had been involved in a conspiracy to alter the way in which the property portfolio of the family was held so that the IBRC was not able to access it. The men had until midnight last night to reverse those steps and Justice Dunne had said that she would consider punitive measures such as a prison sentence if the order was not cooperated with. The court has also been made aware of video footage obtained by the Irish Daily Mail which was shot in the Ukraine in January. It shows Peter Quinn expressing his willingness to lie to the High Court. Email “Members of Quinn family could face prison sentences today”. Feedback on “Members of Quinn family could face prison sentences today”.